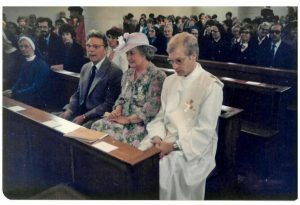 My missionary journey started in 1975, when on the Feast of the Epiphany I was received into the Catholic Church. In September of the same year I began my formation as a missionary priest with the Mill Hill Missionaries (MHM). 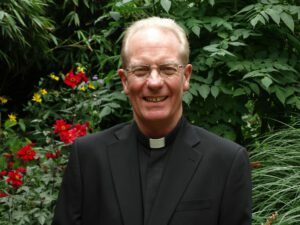 I celebrated my 21st birthday in the first week of my stay in the MHM missionary college in Holland where I spent three very happy years discovering the meaning of what it means to be a missionary and a priest, and how to live in a Christian community. This was closely followed by one year’s missionary experience in Nairobi, Kenya, and it is here that I first discovered how much Africa has to teach us about faith in a God who is our constant companion. It is here that I first experienced the joy of celebrating life that, even in the face of trial and adversity, is so natural to the people there. Returning to St Joseph’s College, Mill Hill, London, I completed my formation and was ordained in my home parish of St Augustine’s, Barkingside. I would like to pay special tribute to the priests and people of that parish who, for the past forty years, have accepted me as one of the family. They have always made me feel welcome and have the patience of Job in listening to my extended homilies, often composed of missionary stories! They have taught me the importance of encouragement. My first appointment after ordination was to western Kenya, to what was then a quiet lakeside town called Kisumu. For nine years I lived and worked among its people, spending six of those as Town Youth Chaplain. It was here that I learnt my most valuable lesson as a missionary – the people we serve have, more often than not, much more to give, teach and offer us than we have to give, teach and offer them. As the chaplain to the youth of Kisumu town it soon became clear that we needed a small youth centre to run our entire youth training programme, the small-project training programme, as well as a place for youth Masses and other prayerful activities. The diocese had no money to spare and, along with their chaplain, the youth were penniless. 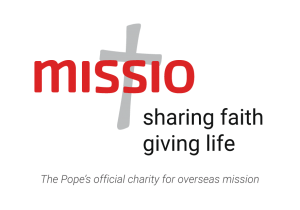 The bishop recommended that I write to Missio and within six months, after a long and detailed process of application, Missio sent us the money to build our centre. Thirty years later the building is still standing and being used by the youth for the youth. Thank you Missio! 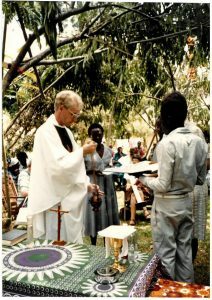 Sadly, I left Kenya in 1990, and after two years of theological studies in Chicago, I returned to St Joseph’s College, Mill Hill, where I helped to prepare students for the priesthood and mission. There was new and abundant life coming to the college as, for the first time, we happily received students from Africa and Asia, to join our small band of students from Europe. 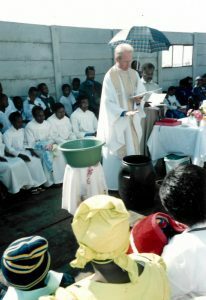 In 2001, I was appointed to South Africa, to work in the African townships surrounding the industrial town of Sasolburg. Driving through the endless rows of corrugated iron dwellings, along dusty windswept roads with very little else to offer, it was clear that such artificially created communities are more places of despair than hope, of violent conflict than peaceful coexistence. Yet, once I grew closer to the people I discovered a resilience and strength of character which gave birth to hope. For the last ten years I had the privilege of serving the Mill Hill Missionaries as their General Superior. The most enjoyable part of my ministry was to visit missionaries throughout the world to learn how they were serving the people among whom they lived. Time and again I was inspired and challenged by the selfless service of such diverse characters in often very stressful and inhospitable circumstances. It made me proud to be a Mill Hill Missionary. In my new position as National Director I still have much to learn. As the Holy Father’s charity we occupy a unique position in the Catholic Church. He takes a very personal interest in what we are doing and encourages us to show passion for mission.  I hope that Missio England and Wales will always be known as a charity that enables the young churches across the world, to love and serve humanity, especially those in greatest need. May the Lord of the harvest grant us fruit in abundance. In Kent and my parents lived in Essex, though I consider myself a Londoner. Hot and spicy daal. I think I could eat it every day, and in fact about a quarter of world’s population does. What is your favourite Bible verse? Why? ‘The Kingdom of God is near at hand.’ This was Jesus’ first mission statement, and really sums up our mission. To be honest, I don’t really do ‘regrets’ because what has passed needs to rest in the past. The Gospel frees us from the tyranny of the past and points us to the promise of the future, hopefully having learnt the lessons of the past. This is what forgiveness is all about, is it not? If you had the chance, what would you tell the world? If you ask a missionary this question there can only be one answer. In a nutshell? Just listen, really listen, to what Jesus Christ has to say and do something about it. The need to keep the call to mission alive and flourishing in our Church here in England and Wales. What are you thrilled by? By the ways the Church is flourishing in so many places throughout the world. I am thrilled when I see people excited by the words of Jesus Christ, and responding to them by caring for those around them in need. What Pope Francis recently described as ‘blessed stillness’, that is, apathy, indifference, luke-warmness. These dampen the fire of the Gospel and stifle missionary action. Who would you invite over for dinner? Nelson Mandela as I have been a fan of his ever since I lived in Cape Town in the early 70s, and was told all about ‘that terrorist’ imprisoned across the waters on inhospitable Robben Island. I would like to hear from where he found the strength to endure suffering, forgive his oppressors and work hard for reconciliation.